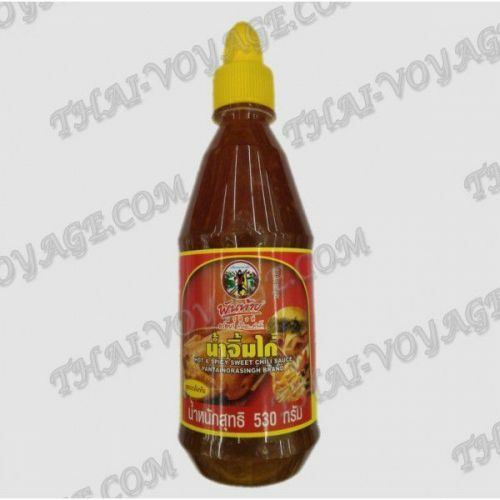 Moderately spicy famous Thai sweet chili sauce is one of the honored first among the sauces in Thai cuisine. Thai sweet chili sauce is ideal as hearty pieces of grilled chicken or meat, and marinating and roasting. Thai sweet chili sauce is the least spicy of the Thai chili sauces, with traditional spicy-sour-sweet taste. Due to its soft, but bright taste of sweet chili sauce like almost all Europeans from the first time. The sauce is perfect for chicken, you can also use Thai sweet chili sauce and hearty fried pieces of pork or beef, fish, vegetables and rice, for the sauce to cats or spring rolls. You can also use Thai sweet chili sauce and marinade the meat before roasting. Contains no preservatives or MSG.